In this installment of design process, I'm going to talk about the quick video publishing feature that we added within the Media Module application. During the creation of Brightcove 3, we interviewed publishers and engaged them in usability testing of design concepts so we could better understand their needs. One finding from our research was that publishers need a quick way to publish a single video to a website or blog. 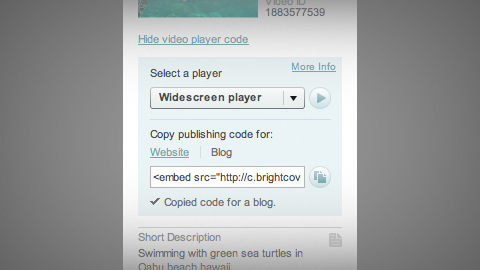 In the previous version of Brightcove, the workflow was the same, whether publishing a single video or multiple videos. We found that we could reduce the steps when publishing time-sensitive videos or simply adding a video to a blog post. Our goal with the design of this "quick publish" feature was to provide the player code for a single video in the fewest steps possible while keeping the process intuitive. After testing a few design concepts, we felt that providing a contextual link within the Details area of each video would meet this goal. Surfacing the link in Details also meant every uploaded video could be published in a few seconds. While we were happy with this solution, we also understood that not all videos would be published this way: Publishers would still want to program videos into larger video players grouped into playlists. Also, we wanted to address the fact that once a video is published, it's unlikely it would need to be published again. Thus, we decided to collapse the link to get the player code by default, but expand it on clicking to display the publishing options. 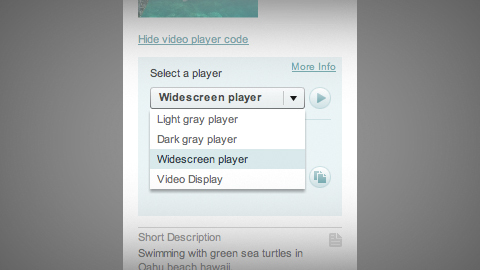 Since our goal was to save publishers time, we have made the first single video player the default. This way, publishers can quickly copy the publishing code without selecting a player. That was a straightforward choice. But we went a step further to allow quick access to players that have a customized look and feel or whose dimensions have been modified. During testing, we found that publishers tend to reuse custom-designed players frequently—for example, a player customized for a blog with a dark background. Now, the last player used in quick publish appears as the default in the drop-down menu for all videos. And since players can have similar names we added a preview button so that you can see the video in the live player before copying the code. The new quick video publish features reduced the number of steps for publishing a single video from nine in the previous version to just three clicks in Brightcove 3. Another major benefit is not having to create a separate player for each video published, something the previous version also required. 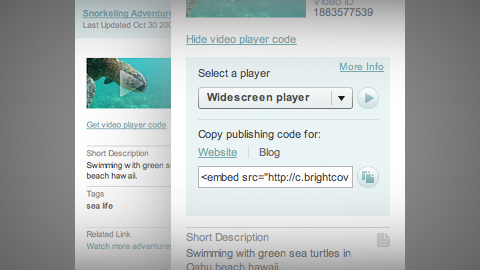 Now you can just upload a video, select a player, and copy the code.